Create a design and simulate using EE-Sim® tools: The MAX1044 and ICL7660 are monolithic, CMOS switched-capacitor voltage converters that invert, double, divide, or multiply a positive input voltage. They are pin compatible with the industry-standard ICL7660 and LTC1044. Operation is guaranteed from 1.5V to 10V with no external diode over the full temperature range. They deliver 10mA with a 0.5V output drop. The MAX1044 has a BOOST pin that raises the oscillator frequency above the audio band and reduces external capacitor size requirements. 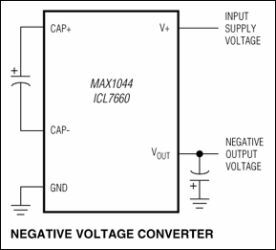 The MAX1044/ICL7660 combine low quiescent current and high efficiency. Oscillator control circuitry and four power MOSFET switches are included on-chip. Applications include generating a -5V supply from a +5V logic supply to power analog circuitry. For applications requiring more power, the MAX660 delivers up to 100mA with a voltage drop of less than 0.65V.